What happens when the planners are not going to allow you to do something which you think is completely reasonable? It is important to understand how planners think. At the end of the day most of them want an easy life and a guaranteed salary so they tend to try to achieve an outcome which upsets the fewest number of people that matter. They are not particularly interested in things like creative design, community politics or the local economy, although they will pay lip service to such high ideals. Their strongest argument is nearly always about whether a proposal fits in with the surroundings and what already exists. Hence the dilemma which arises when someone proposes a bold modern self build design in some kind of traditional area, even if that traditional area is a boring stretch of jerry built 1930s housing. Their whole approach is geared to matching various lowest common denominators and indeed it can be a very difficult argument to get past. You also need to know when the planners are driven by technical issues, when by policy and when by personal opinions. (for want of a better term) . It can also occasionally happen that political motivations or graft are at play and override the role of planners. Planning policy is not about any one individual because you might sell your house next year to someone who has 5 cars. These are area-wide policies. Parking policy can lead to interesting results. In some areas where off-road parking is a difficult issue, councils have requested drawings for the landscaping of the garden and parking area. If there was any mention of roses in this area they have been banned on the basis that roses don’t always get pruned properly, they get out of hand and tend to scratch people parking nearby which causes people to park on the road rather than in the drive or car parking area. This clutters up the roads. Yes the reach of planners can be long and peculiar. These are probably policies which has been developed over many years by the council in an effort to prevent on-street parking. It is very difficult to argue against these kinds of thing with a planner as they have a lot of long term technical support from other departments behind them. Where it is a matter of policy you need to find out what sort of policy this is. Policies arise for all sorts of reasons, some quite sensible and others completely batty. For instance, planners may insist that you use a building material which is traditional to the area whereas you feel that this is no longer appropriate. Occasionally you come across a planner with a bee in his bonnet about something. This can be difficult to distinguish from what is accepted council policy. If you suspect you are dealing with someone like this then try getting in touch with a different member of the planning team or the officer’s manager and check out whether they are following correct procedures. It is no accident that some people manage to get planning permissionthe legal basis for being allowed to do some form of development such as building a house. (not to be confused with Building RegulationsThese are the mass of regulations that cover safety, health, welfare, convenience, energy efficiency etc. in the way buildings are constructed. Not to be confused with Planning consent (which is more to do with whether you can put up the building in the first place). See more on the regulations which are all about whether the building is properly constructed). see more on Planning the legal basis for being allowed to do some form of development such as building a house. (not to be confused with Building Regulations which is all about whether the building is properly constructed). see more on Planning for the most inappropriate buildings while others get turned down on reasonable applications. This is sometimes to do with what’s called planning gain (e.g. permission is given in exchange for some land the council needs for community use) but very often it is about the old boys network and who knows whom. Often whole communities fight long and hard for the type of housing they feel appropriate in an area, whereas powerful commercial interests can often achieve their ends by more devious means. So what can you do when the planners are against you? Well fortunately, quite a lot. You can approach your councillors and put your case. If sympathetic, they may well support your application for you self build project when it comes up at the meeting of the council. What might typically happen is that at the meeting most applications will be accepted or refused “on the nod” depending on the planner’s recommendation but when it comes to yours, your sympathetic councillor will stand up and support you. Providing there is nothing dangerous, illegal, or outrageous, etc. about your application then the planner may be quite happy to hand the decision over to the political process knowing that if, for instance, neighbouring people have objected then it will be the council that takes the blame for the decision rather than the planner. 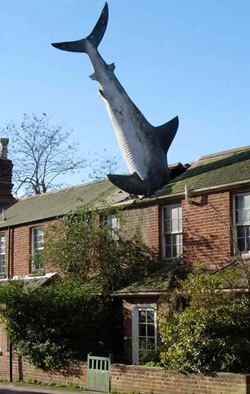 A famously interesting and extremely protracted case of all this happening concerns the famous shark sculpture in Headington, Oxford. Planning consultants are professional advisers in planning matters who you can employ to put forward your case. They will often spot technical issues which have been overlooked and are an extremely powerful way to get results, especially if you make an appeal against a refusal. They do not come cheap but may be well worth the money. If you feel you are being ridden roughshod by the planning process they can often force the planners to take a deep breath and see things differently. If they can do their bit by stating recommendations which upset the minimum number of people in the area concerned and match the council’s policy then they have done their job. A planning consultant’s job is to either catch them out on a technicality or to influence the council in some more fundamental way which overrides the normal planner’s approach. You have the right to appeal against a decision and there is an established procedure for this. Normally you appeal only as a last resort when all negotiations have failed. Ultimately, if you were so minded you could pursue the matter to the House of Lords. The procedure for appeal is set out in the government’s Planning Portal.